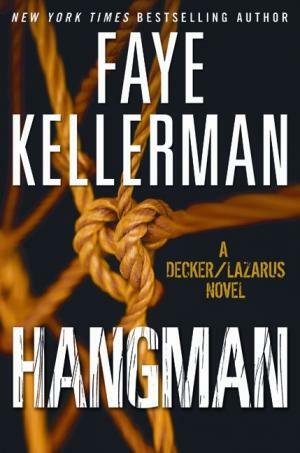 Hangman, the nineteenth entry in Faye Kellerman's Peter Decker/Rina Lazarus series, has a double mystery. Who killed young party-hearty nurse Adrianna Blanc, found hanging at a construction site? And what happened to Theresa McLaughlin, an old acquaintance of Decker, who has disappeared after a tense confrontation with her hit man husband? The former case is an official LAPD matter, which means Decker gets a helping hand from fellow cops Sergeant Marge Dunn and Detective Scott Oliver. The investigation into Terry McLaughlin's whereabouts, however, is more of a personal matter, especially since her fifteen-year-old son Gabe is now staying with the Lieutenant and his wife. The details of the police work seem very authentic. The focus is on following up on realistic leads rather than on the heroics of the lawmen and women. We get a good picture of how cops proceed in a murder case and the toll it takes on the police and their families, as well as a glimpse at the reactions of the victim's friends and relatives. While the crime investigation was intriguing, the most interesting sections are those concerning Gabe and his struggle to adapt to his new parent-less state. (His father makes contact on several occasions but decides his son will be better off with the Deckers.) It's amusing to see how Gabe, who went to a Catholic school in New York, reacts when he is suddenly thrust among the Orthodox Jewish Decker clan and begins attending a religious school with seventeen-year-old Hannah Decker. The Deckers must also adjust to having this young musical prodigy in the house. Hangman is an engaging mystery that humanizes its police protagonist and avoids the “supercop” clichés we've seen too many times. Both fans of the series and new readers will find it hard to put down. Based on your review, I'm reserving the book at the library today! I like this series but sometimes feel that the books get formulaic. You've made a good case that this one has enough different elements in it to make it worth looking into.